Salmon fishing on the big open water of Lake Ontario has no equal. 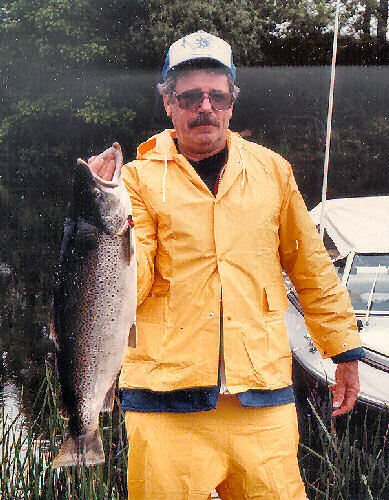 Lake Ontario fishing for brown trout, steelhead, lake trout and bass is excellent as well. We fish the Lake Ontario shore from Nine Mile Point, 14 miles south of Sandy Pond up to Stony Point, 14 miles north of Sandy Pond. Lake Ontario fishing is similar to ocean fishing; catches increase when you travel to the hot spots. Many people ask me, “Where are the fishing hot spots?” The answer is, “Everywhere at the right time.” For example, fishing for spring brown trout is best at the mouth of tributaries (where they empty into Lake Ontario), such as Sage Creek, Salmon River, Sandy Pond, and Lakeview Marsh (North Sandy Creek and South Sandy Creek empty into the marsh.) In September, I might fish for Salmon at the mouth of Salmon River for the first hours of daylight, then swing up in front of Sandy Pond and fish for the middle part of the day, and then back to the mouth of the Salmon River for the evening. Each spot shines at a different time. Of course there are many other factors to success when fishing for king salmon, brown trout, and lake trout besides where, and what time of day, and the season. Rods, reels, bait (artificial and natural), line, speed, and water clarity all have a part in the Lake Ontario fishing success equation. Salmon River, Pulaski is famous throughout the northeast for great salmon fishing and large ‘football’ shaped brown trout. 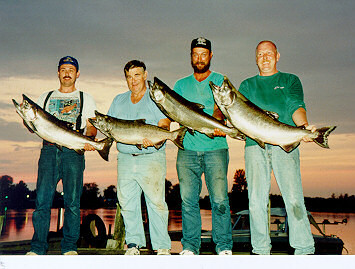 Pulaski's serious salmon fishing really begins in Lake Ontario in July when the salmon show up in Lake Ontario’s Mexico Bay and gorge themselves on alewives. Salmon feed in schools scattered from Nine Mile Point to Henderson Harbor. As August approaches, more and more salmon move closer to the Salmon River area. 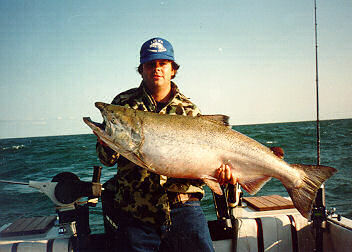 By mid August a few salmon are running Salmon River and thousands are out in Lake Ontario staging off the Salmon River. Mid August starts the month long peak of Lake Ontario salmon fishing as more and more salmon move closer to Salmon River. If you have a larger boat, travel to your hot spot is best by water. A smaller boat can be trailered to different areas of Lake Ontario. Bass fishing in Lake Ontario means smallmouth bass. Smallmouth bass range normally from 14” to 19” and are plentiful. The largest smallmouth bass I’ve seen measured 23 ½”. This huge smallmouth bass was caught in Sandy Pond while trolling for browns on a windy day. Many smallmouth bass are caught in Sandy Pond’s channel to Lake Ontario. They can be caught there from the beginning of bass season (the 3rd Saturday in June) through the season’s end. 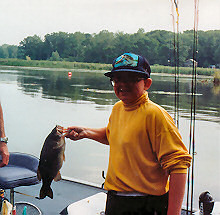 Many smallmouth bass are caught in other local estuaries, especially early in the season but most smallmouth bass fishing is done out on Lake Ontario. The preferred method is drifting live bait or a tube bait along the bottom. From the lakeshore you can see boats drifting in 15 to 40 feet of water over all the known smallmouth bass hot spots. For many of the local fisherman, smallmouth bass fishing is Lake Ontario fishing. Salmon fishing comes second. Largemouth bass are plentiful in Sandy Pond and Lakeview marsh from it's Lake Ontario mouth and upstream. Our Lake Ontario cottage are three waterfront cottage rentals in New York State. Guests return each year to enjoy family vacations, family reunion vacations, fishing NY’s famous Salmon River, fishing Lake Ontario and Sandy Pond, hunting New York Deer, ducks, geese and wild turkey and to photograph diverse scenery of NY’s Salmon River, Sandy Pond and Lake Ontario. We New York!